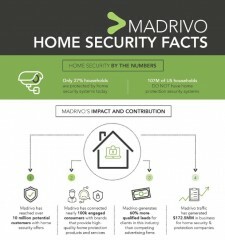 LAS VEGAS, February 13, 2018	(Newswire.com) - A recent study revealed that Madrivo, a premier advertising network, reached tens of millions of consumers and helped nearly 100,000 U.S. homeowners protect themselves with trusted home security brands. The home security market continues to grow and is estimated to reach $51.5 billion by 2022. This is largely in part due to an increased awareness related to safety and security as well as an increased rate of crime and growth in the adoption of cloud-based technologies. However, only 27 percent of households are protected by home security systems today and 107 million U.S. households do not have home protection security systems of any kind. 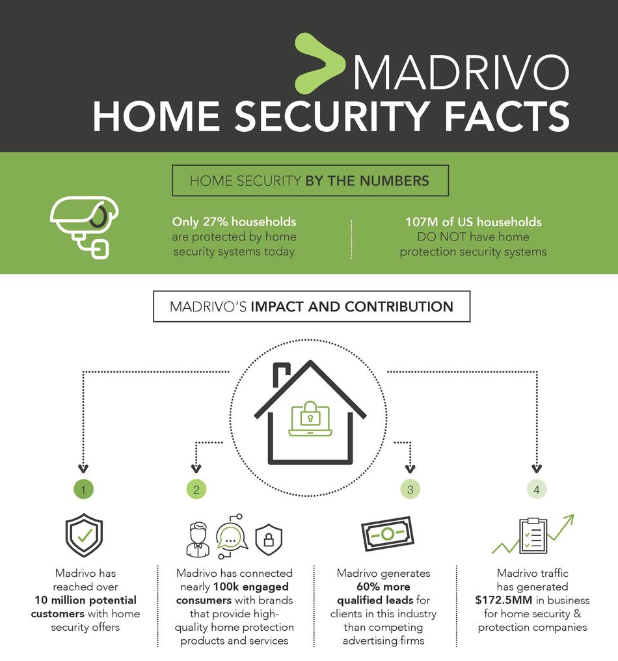 Madrivo’s impact on the home security industry is vast, reaching over 10 million potential customers with home security offers through strategic campaigns. The network’s mission is to connect engaged consumers with valuable brands that provide quality home-related products and services. As a result, Madrivo acquired 60 percent more qualified new customers for clients than competing advertising firms in the email marketing space and has already generated $172.5 million in business for home protection and security companies. This year, Madrivo will focus on extending the reach of their impact on the home security industry and other market sectors where quality lead generation campaigns benefit both consumers and brands. The network is committed to sharing its customer acquisition expertise with the goal of having a positive influence on the performance marketing industry and the different players involved. Madrivo is an integrated online media firm that has quickly gained recognition as a leader in email advertising, affiliate marketing and lead generation. Madrivo offers an unparalleled value proposition to both advertisers and publishers thanks to its impressive analytics, high compliance standards and the quality and volume of exclusive media in its network. Madrivo created an exclusive, high-performance, invitation-only network by handpicking the highest-performing and most-compliant publishers and matching them with quality advertisers who demand the very best from the affiliate marketplace. Madrivo is an integrated online media firm that has quickly gained recognition as a leader in email advertising, affiliate marketing and lead generation. 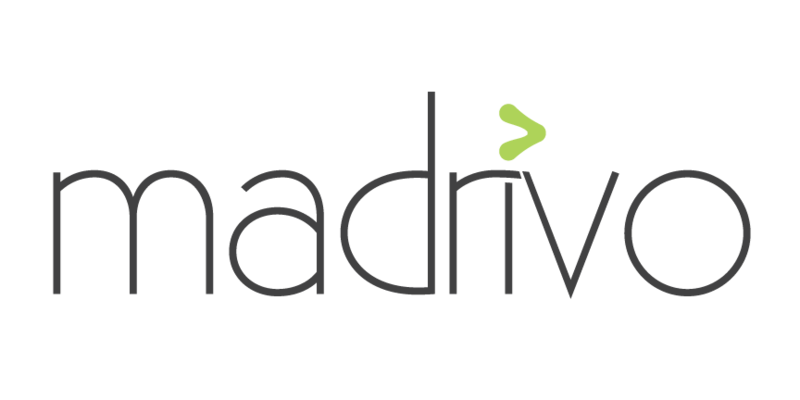 Madrivo offers an unparalleled value proposition to both advertisers and publishers. MarCom announced Madrivo has been awarded with the Platinum award for connecting over 1.8 million Americans with affordable life insurance through email marketing. As of Sept. 1, 2018, Madrivo - a rapidly growing email marketing network based out of Las Vegas, NV - delivered more than 33.9 billion impressions and over 12 million leads through relevant and engaging content, disrupting the nearly $200 billion dollar advertising industry and changing the way brands think about email marketing.